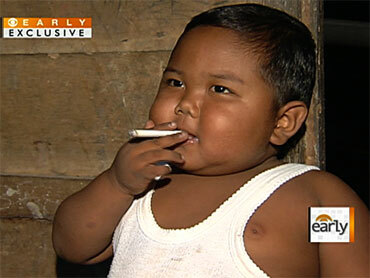 Remember the recent, disturbing video of a two-year-old Indonesian boy chain-smoking? It went viral, spreading quickly across TV talk shows and newscasts, sparking outrage and disbelief. So, reports CBS News Correspondent Jeff Glor, a CBS News team travelled to the Indonesian island of Sumatra in search of the boy. At home, Aldi plays with toys and grips a bottle. But his tiny hands also light cigarettes with the familiarity of a seasoned smoker. His parents, Rizal and Diana, say he started smoking when he was just eleven-months-old, during daily trips to the market where they sell fish. "He was being very fussy, always cried when we were there to sell," Diana explained, through an interpreter. "So, we just let him play by himself. … One day, we followed him from behind and found him hanging out at a cigarette stall. … He had a cigarette in his hand, already lit. … He already knew how to do it very well, like an adult. … It was actually his own wish." Before long, Aldi was smoking more than 40 cigarettes a day. In fact, his mother says he often uses one cigarette to light the next. And adults at the market are seen in the CBS video lighting them for him, as well. But in Indonesia, Glor observes, Aldi may not be such a surprising case. Smoking is ingrained in the country's culture; it's the third-largest tobacco consuming nation in the world. A-third of the population smokes -- including many children. Nearly 170 nations have signed the World Health Organization's tobacco treaty calling for anti-smoking measures. Though the Indonesian Ministry of Health hasn't conformed, the government now tells CBS News, "Indonesia is prepared to ... ratify the Framework Convention on Tobacco Control," according to Glor. Since the one of Aldi, more videos have surfaced online of babies blowing smoke rings. Aldi and his family are now in a rehabilitation program sponsored by Indonesia's National Commission for Child Protection, his parents told our crew. But a smoke-free future for him is still uncertain. He shows signs of a severe addiction -- throwing tantrums, hitting his head on the floor and becoming sick from withdrawal when he can't smoke. "A child who's smoking many cigarettes a day," says Dr. Alanna Levine, a pediatrician, "can absolutely be addicted to nicotine … so it's not easy for him to just stop smoking cold turkey." Says Diana, Aldi's mother, "If he can really quit smoking, he will definitely be a very healthy boy, without any disease. But now, I don't know of what will happen in the future." "There are numerous long-term effects on children who smoke cigarettes or are exposed to second-hand smoke," Levine notes. "You see an increase in upper-respiratory infections, you see an increase in ear infections, you see permanent lung damage. It damages the capacity for the lungs to function, which will decrease his exercise tolerance and contribute to obesity, and metabolic problems that can come later on. … This boy's lungs are still developing. So anything that's going to damage his lung tissue is going to damage it permanently, and it's really going to decrease his total lung function later on, for his entire life." "Nowadays," says Diana, "he smokes one pack a day, two packs at most. … We surely hope he will quit, that he will be like any other kid, not smoking. … But I can't stand seeing him hurting himself. What can we do but to accept it is as it is?"